Same thing happened to me years ago near Port Ontario on a J plug. Years ago I had a Lowrance paper graph that the drive for the paper was worn out from use. Lowrance had some reps at a tournament in Oswego and were repairing units free. The rep took mine apart removed the paper drive then replace it with a new and improved drive and went into the electronics and wired it so I could slow the paper down even slower than before. The paper wasn't cheap so this was great. I wrote Lowrance and said you have a customer for life. No other company that makes anything would do that for free. I wouldn't have anything else in my boat. I have a 1969 Starcraft Holiday. I replaced my transom for the second time a few years ago. The first time I used exterior plywood and just painted it. Was not a good idea. This time I used marine plywood and sealed it with epoxy I got from West Marine. I think it has been 4 years now and looks like new. Well worth the effort and expense. One thing I added was scuppers over the drain holes. They keep a lot of water from entering the transom area in rougher water. Did you get the payment? Took my cousin Paul out this morning and got his first King. 34 inches. 20 feet of water 10' down on rigger NBK Stinger 100' back. Went out this morning heading East and picked up a couple nice Kings. One 36 inches the other 25. 20 feet of water Both on Stinger spoons. One on a downrigger down 10' the other on 3 colors of lead core. Also later a 23 inch Brown in 15' of water of a rigger 5' down on a Stinger. A spoon day for me. Dragged Bay Rats all day without a strike. We lost our West Marine in North Syracuse a couple years ago. They left us with no options other than travel. I replaced the transom on my 18 foot Starcraft a few years ago and bought my epoxy there. They had a hidden location in a tiny strip mall and I believe not many people realized they were there. They also had the windows covered from the inside and always looked like they were closed. Looking forward to some good ice this year. Couldn't agree more. I was looking forward to this weekend but my 18 foot boat will stay on the lift until this blows over. Other than the late start this year the fishing has been good. Finally got out on the 4th. Just 2 Browns one on an NBK spoon at 95 over 120 that surprised me and the other on a watermelon pattern spoon at 75. Dragged a 450 copper meat rig with one hit and miss. We marked lots of bait and fish but never figured the right combination. Not many boats out deep for a holiday weekend. Got out once for browns before the flood. Looks like I won't again until it's over. Going to be a short season. State Park launch yesterday. The beach is gone. The launch is fine but the docks are only about 4 inches above water. We just trolled West Friday and Saturday. Picked up 4 nice Browns just around the last bluff before Port Bay. All on Bay Rats. We were in close but the power cord on my graph shorted and had to troll blind. New cord came today. Hope to be back out Sunday. Went 4-5 Friday and Saturday trolling for Browns West to Port Bay from Fair Haven. Looking forward to getting out on the ice. New tip-ups and replacing the throttle on my power auger. I have a 90hp 4stroke Merc and I replaced a regulator rectifier last year and could have bought the part from Yamaha. They made the power head. The rest was made by Mercury. Mine is a 2000 model year maybe they don't anymore. Other than that one part it has been a great motor. The Mercury 4 stroke power heads are made by Yamaha. I have a 2000 90hp Mercury 4 stroke on an old 18 Starcraft Holiday. It will troll down to 1.5 mph and uses far less than my old 15hp Johnson kicker. I have a 12 gallon fuel tank but only use a 6 gallon tank that came with it. In the years I have had it I have never came close to running out in a day. I was also out there and brought a second boat. One release between the both of us. Marked a lot of fish but they didn't cooperate. Went out late this morning and didn't mark any Kings or bait. Did get a 30 inch Laker on F/F. We did keep going. 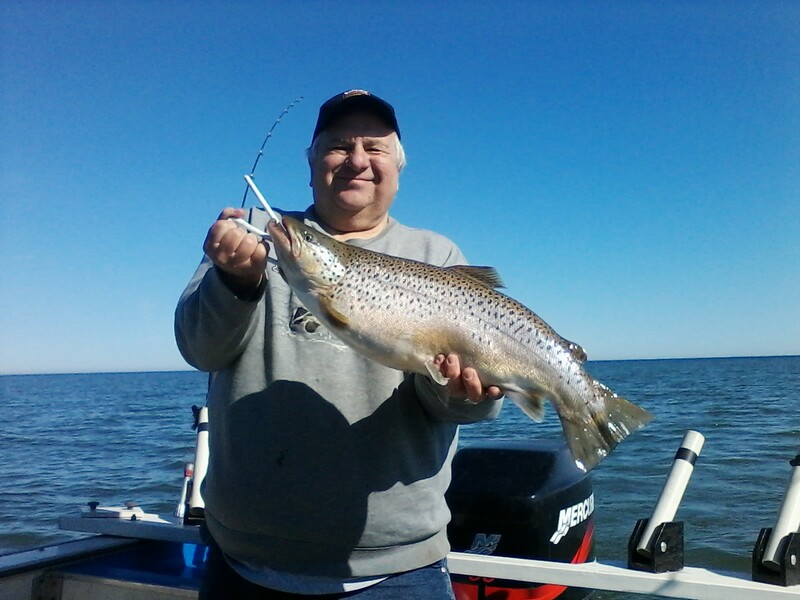 Sunday we boated a 28" Brown and this afternoon a 28" King with 4 releases. Best weekend ever even with having to sit out Saturday with wind. All fish taken on spoons. Good day toady. 3 Steelhead 22" 26"& 28" one 4# Brown. All on spoons.